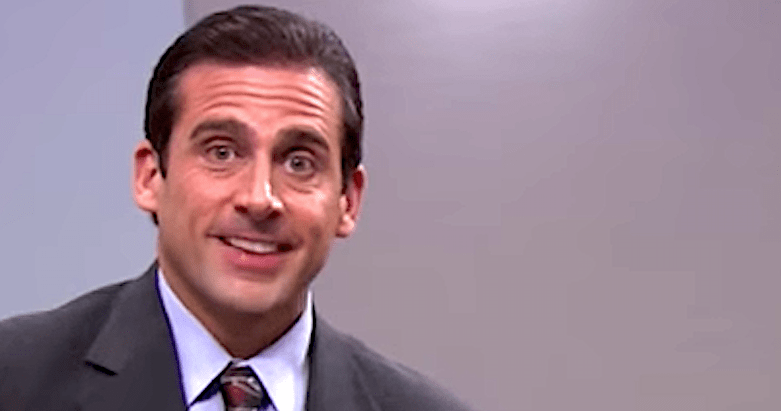 Michael Scott, the hapless regional manager in The Office, is one of the great characters in television. That mix of blustering confidence in his mouth and self-doubt in his eyes is a picture of striving lameness — a mediocrity who has somehow convinced circus management he’s a high-wire walker, then suddenly finds himself 50 feet above a pit of flaming tigers, naked, deciding whether to spend the surplus on a new copier or chairs. Steve Carell captures this perfectly in the character of Michael Scott. The show’s theme manages to do the same in music, three ways in 30 seconds. First there’s the choice of instrument for the melody. When an accordion is going full tilt boogie, chords and all, it can be incredible. But a single, reedy, wheezy little solo accordion line is the essence of striving lameness, reaching for Van Gogh’s Starry Night and managing only a velvet Elvis. It is Michael Scott. Something weird happens in the second bar. See how the wheezy accordion in the top line hangs on a G from the previous bar? Now look at the harmony in the second bar — specifically the lowest note in the middle staff. It moves from G in the first measure to F# in the second, even as the accordion hangs on G up above. The harmony is right — it’s a B minor triad. But Accordion Michael Scott is oblivious to the fact that the harmony changed beneath him. Because of course he is. If they had both hung on and changed at the same time, it might have been a pretty thing called a 6-5 suspension. Instead, for two full beats we get G and F# mashing against each other like Steve and Melissa at the 25th reunion. Hear that clash in the second bar? It’s intentionally wrong. It’s hamfisted and lame. It’s Michael Scott. And it happens twice in eight bars. THAT is the most Michael thing of all.